Jonathan Sklar is a training analyst and fellow of the British Psychoanalytic Society. He now works in full time analytic practice in London. From 2007-2011 he was Vice President of the European Psychoanalytic Federation. He is the author of many publications, e.g: Landscapes of the Dark: History, Trauma, Psychoanalysis and Balint, Groups and Training. Dr. Michael Parsons is a training psychoanalyst at the British Psychoanalytical Society, a member of L’Association Psychanalytique de France and of the Royal College of Psychiatrists. He is the author of books such as Living Psychoanalysis: From Theory’s Experience, 2014, Routledge and The Dove That Returns, The Dove That Vanishes: Paradox and Creativity in Psychoanalysis, 2000, Routledge, and of numerous publications in many psychoanalytic writings. Rosine Jozef Perelberg, PhD is a Training Analyst and Supervisor and a Fellow of the British Psycho-Analytical Society, Visiting Professor in the Psychoanalysis Unit, Research Department of Clinical, Educational and Health Psychology at University College, London, Corresponding Member of the Société Psychanalytique de Paris. She is the author of many books, e.g: Time, Space and Phantasy; Gender and Power in Families and Dreaming and Thinking. She has a psychoanalytic private practice in London. Present without Past. The disruption of temporal integration in a case of transsexuality. The Hour of the Stranger: A psychoanalytic view of adolescence and the complex relationship between development and what is known as “emerging borderline personality disorder” during the teenage years. Jan Abram is a psychoanalyst in private practice in London. She is a Member of the British Psychoanalytical Society; Honorary Archivist of The Winnicott Trust; Member of the London Editorial Board for The International Journal of Psychoanalysis. She was director of the Squiggle Foundation from 1996-2000. Leon Kleimberg is a training psychoanalyst at the British Psychoanalytical Society, a lecturer at the Tavistock Clinic as well as University College London. He is also the author of many publications about psychoanalysis within in the fields of psychopathology, creativity and immigration. David Bell is a Training and Supervising psychoanalyst of the British Psychoanalytic Society. He was a President BPS. He is a consultant psychiatrist in psychotherapy in the Adult Dept of the Tavistock and Portman NHS Trust where he is director of Fitzjohns Unit, a specialist unit for serious psychological disorders. He teaches Freud and the history of psychoanalytic concepts at the Institute of Psychoanalysis and at the Tavistock Clinic. He is a Professorial Fellow at Birkbeck College. He writes and lectures on a variety of subjects including the history and development of psychoanalytic concepts (Freud, Klein and Bion), psychosis, personality disorder, suicide and trauma. Throughout his professional career he has been deeply involved in the relation between psychoanalysis and other disciplines such as literature, philosophy, culture and socio-political issues and has made numerous contributions in these areas. He is one of the UK’s leading psychiatric expert in asylum and immigration, human rights. He has written numerous papers and chapters in books and monographs, edited: Reason and Passion; Psychoanalysis and Culture: a Kleinian perspective; Paranoia and Living On The Border. Edna O’Shaughnessy is a Distinguished Fellow and Training and Supervising Analyst of the British Psychoanalytical Society. She came to psychoanalysis from a background of philosophy. She moved to Britain from South Africa in the 1950s, and trained as a child psychotherapist at the Tavistock Clinic. She then trained as a psychoanalyst at the British Society in the 1960s, with Roger Money-Kyrle as her training analyst. Using Klein’s theories, O’Shaughnessy was one of an influential group of post-Kleinian analysts who in the late 1970s and 1980s explicated the vicissitudes of defensive organisations of the personality. Her two most important papers in this area are entitled, ‘A clinical study of a defensive organization’ (1981) and ‘Enclaves and Excursions’ (1992). O`Shaughnessy expanded the concept of abnormal superego. In ‘Relating to the Super-ego’, (1999) she described the normal superego as originating from the earliest object relations, while the abnormal superego arises from the earliest dissociations that have been inflicted and suffered in childhood. 1981 O’Shaughnessy, E. ‘A clinical study of a defensive organization’. International Journal of Psychoanalysis. 62:359-428. Republished in E. Spillius, (ed.) Melanie Klein Today Vol. 2. Routledge (1988). 1992 O’Shaughnessy, E. ‘Enclaves and Excursions’. International Journal of Psychoanalysis. 73(4): 603-614. 1999 O’Shaughnessy, E. ‘Relating to the superego’. International Journal of Psychoanalysis. 80(5): 861-870. Republished in C. Mawson (ed.) Bion Today. Routledge (2011). 2011 Spillius, E. and O’Shaughnessy, E. (eds.) Projective Identification: The Fate of a Concept. Routledge. 2014 O’Shaughnessy, E and Rusbridger, R. (ed) Inquiries in Psychoanalysis: Collected papers of Edna O’Shaughnessy. Routledge. Following the theoretical papers, Beata Maciejewska-Sobczak (Polish Psychoanalytical Society) presented clinical material which was discussed from both theoretical approaches by Jan Abram and Robert Hinshelwood. Beata Maciejewska-Sobczak is a psychoanalyst, member of the Polish Psychoanalytic Society, training and supervising therapist of the Polish Psychoanalytic Psychotherapy Society. She is co-editor of Siblings. Envy and Rivalry, Coexistence and Concern (Karnac 2014). Psychotic Process: Defence or Representation of Primary Trauma? Training psychoanalyst, author of many books: A Pattern of Madness; Becoming a Person through Psycho-Analysis; The Psychology of The Person. In 2007 he started an organization Psychotherapy of Psychotic Patients. He teaches extensively in Great Britain, Israel, Norway, Denmark, Poland, Portugal, Germany, Brasil, United States, India, New Zealand and Australia. Training and supervising psychoanalyst and child analyst, academic lecturer. He conducts seminars on primitive mental states and Bionian concepts. He has many papers on the clinical implications of the works of Bion and Meltzer: Attacks on linking as well as a drive to communicate: Tolerating the paradox; On boredom: A close encounter with encapsulated parts of the psyche. 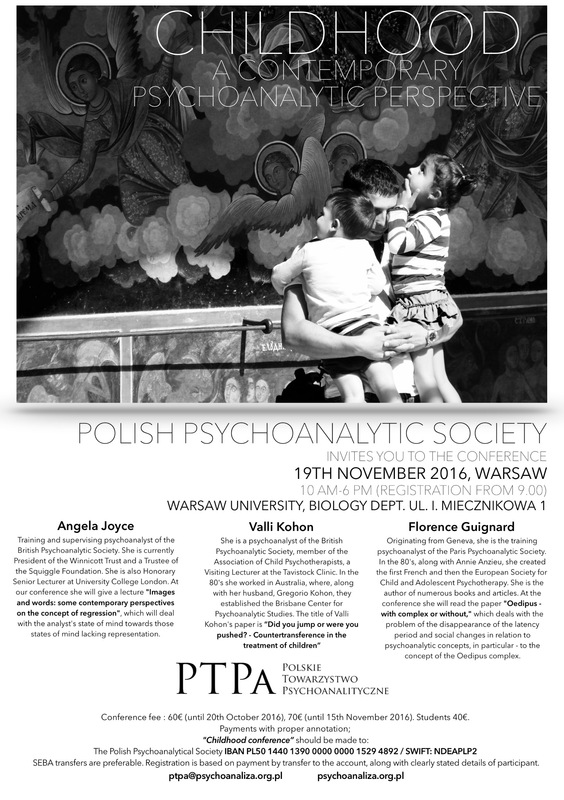 Psychoanalyst, supervising and training therapist of the Polish Psychoanalytic Psychotherapy Society. Author of the book: Psychoanalytic therapy in theory and practice. SEPA transfers are preferable. Registration is based on payment by transfer to the account, along with clearly stated details of participant. Following the theoretical papers Dawid Bieńkowski will present clinical material, which will be discussed from both theoretical approaches. Prof. Jan Abram is a Training and Supervising Analyst of the British Psychoanalytical Society (incorporating the Institute of Psychoanalysis). She is in full time private practice in London; Visiting Professor, Psychoanalysis Unit, University College London; Visiting Lecturer for Tavistock Centre. She is the author of The Language of Winnicott (1996 & 2007) and the editor for Donald Winnicott Today (2013). 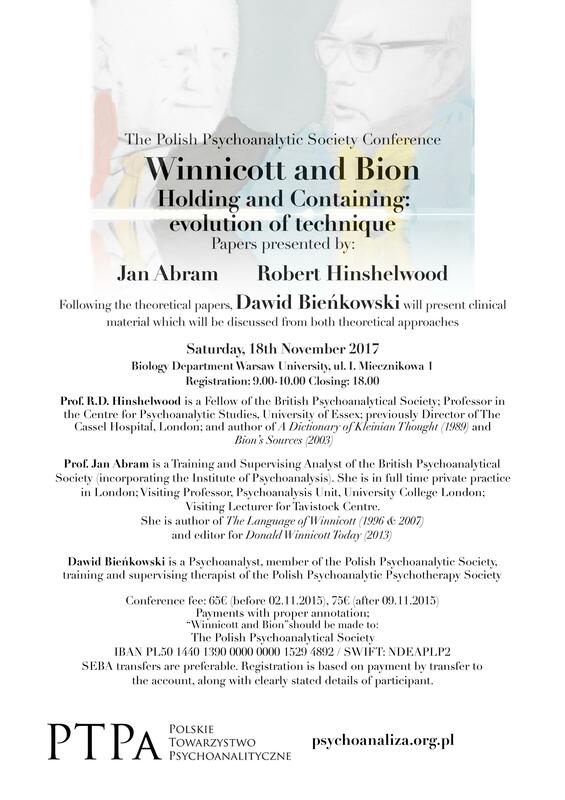 Prof. Robert D. Hinshelwood is a Fellow of the British Psychoanalytical Society; Professor in the Centre for Psychoanalytic Studies, University of Essex; previously Director of The Cassel Hospital, London; and the author of A Dictionary of Kleinian Thought (1989) and Bion’s Sources (2003). Dawid Bieńkowski is a Psychoanalyst, member of the Polish Psychoanalytic Society, training and supervising therapist of the Polish Psychoanalytic Psychotherapy Society. Training and Supervising Psychoanalyst of the British Psychoanalytical Society and Institute. She works in a full time psychoanalytic practice in London and enjoys running clinical workshops for European Analysts three times a year. She has a longstanding interest in psychoanalytic work with adolescents and young adults and supervises the student counsellors at University College London University in their work with students at the college. (Polish Psychoanalytic Society) Psychoanalyst, works with adults, children and teenagers. Her interests also include a psychoanalytic study of literature, film and art. On numerous occasions she taught at the Summer Schools organized by the Han Groen-Prakken Psychoanalytic Institute for Eastern Europe. For three years she has been co-leading, along with prof. Adam Lipszyc, the Seminar „Austrian Literature and Psychoanalysis”, at the Austrian Cultural Forum in Warsaw. 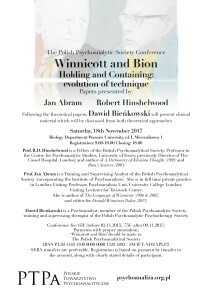 Training and Supervising Psychoanalyst at the British Psychoanalytical Society and an Honorary Member of the Polish Psychoanalytical Society. He teaches in Poland and Germany and was Resident Visiting Professor at Kyoto University in Japan. He is in full time private psychoanalytical practice in the North of England. 65€ (until 30 April 2018), 75€ after this date. Students 40€. SEBA transfers are preferable. Registration is based on payment by transfer to the account, along with clearly stated details of participant. Psychoanalysis as the heir of European Enlightenment preached the ideas of social and individual emancipation. The Freudian project consisted of three elements: ethics of self-knowledge, critical hermeneutics of culture and psychotherapy. But as the result of the development of psychoanalysis the therapeutic element became dominating. We would like to ask the question about the critical potential of contemporary psychoanalysis. Does it offer the adequate cognitive means to understand the disturbing social phenomena? Could it become the critical theory and practice again? Cooperation: Institute of Philosophy and Sociology of the Polish Academy of Sciences, Pedagogical University, Cracow, International Psychoanalytic University Berlin, NPRH Polish Ministry of Science and Higher Education, Polish Psychoanalytic Society, Warsaw, Alexander von Humboldt Foundation, Polin, Museum of the History of Polish Jews, Polish Academy of Sciences. 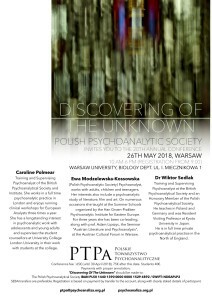 The Polish Psychoanalytical Society is the only organization in Poland offering training – fully compliant with the International Psychoanalytical Association standards – that prepare participants for psychoanalytical practice. The Society also holds training in child and adolescent psychoanalysis; these are exclusive to its members and candidates. All participants have PPS candidate status. In order to become a candidate, individuals must successfully complete preliminary stages and be admitted for the training by the Training Committee. Who can apply for the training Qualification procedures are open to individuals who: • Hold a higher education diploma (Master of Science or Medical School) in medicine, psychology, or in certain cases other related disciplines; • Have at least three years clinical experience (in certain circumstances, the experience can be extended until such time when the individual takes on his/her first patient in a psychoanalytical setting); • Have an interest in psychoanalysis and wish to qualify as a psychoanalyst. Undergoing personal training psychoanalysis is not a precondition to apply for the training. What are the qualification procedures Individuals who meet the three criteria outlined above can apply for the following admission procedures: • They will need to complete a Polish Psychoanalytical Society training application form; • Next, they will be asked to attend two or three admission interviews with selected psychoanalysts. Before attending the first interview, applicants will need to make an admission payment by making a transfer of 400 zlotys to PPS, 00-660 Warsaw, Lwowska Street 5/6, acc. no. 03 1440 1390 0000 0000 8397 (giving the reference “admission”). • Admission decisions are made by the Training Committee and delivered to applicants in writing. Where and when to apply Admission information for new candidates is given by Marzena Kaim, Chairperson of the Admission Subcommittee; tel. 693 837 573 between 8pm and 10pm. The admission process continues throughout the year; however, for individuals wishing to start training in the coming academic year, the deadline for submitting application forms is April the 1st. Applications submitted after that date will be considered after the summer holidays. For successful applicants • Candidates may begin training once they have completed at least a year of training psychoanalysis. Training psychoanalysis must include at least four sessions per week with a training psychoanalyst from the Polish Psychoanalytical Society. • Theoretical training starts every autumn. For unsuccessful applicants • Unsuccessful applicants have the right to learn the reasons for which they were rejected during the interview with a person suggested by the Admission Subcommittee; • A renewed application is possible after at least one year from the previous one. Duration of training Training duration varies and depends on how quickly the candidate completes individual training stages. The shortest time of completing the qualification is five years. Training content Theoretical training starts in Year One and is ongoing. It includes: 1. Seminars covering Sigmund Freud’s theories and Freudian psychotherapeutic techniques; 2. Facultative seminars covering the main trends of psychoanalytical theory, psychopathology in the psychoanalytical perspective, the most important phenomena in the psychoanalytical process, advanced interpretation of detailed theoretical and clinical issues, child and adolescent psychoanalysis, and exploring the boundaries of psychoanalysis and other disciplines; 3. Seminars on professional ethics in psychoanalysis. Clinical training starts in Year Two and continues until the completion of the course. It includes: 1. Clinical seminars for individuals delivering psychotherapy to patients; 2. “Key clinical seminar” for individuals treating patients using psychoanalysis (after obtaining the necessary permission); 3. Individual supervisions of at least two training cases. All seminars are held in five-week cycles with sessions held one evening per week. Personal training psychoanalysis should continue throughout the training. It is especially important for the candidates to be in psychoanalysis when they treat their own training patients. Completing the training • After the completion of training the candidate takes a qualifying colloquium with the Presidium of the Training Committee; if the result is positive, he/she becomes a member of the Polish Psychoanalytical Society. The Polish Psychoanalytical Society is a part of the International Psychoanalytical Association, thus its members receive an international psychoanalytical license. Training in child and adolescent psychoanalysis Training in child and adolescent psychoanalysis can be undertaken by candidates who have obtained permission to treat patients in the psychoanalytical setting, or PPS members (licensed psychoanalysts). The training includes: 1. Obligatory theoretical seminar on child and adolescent psychoanalysis; 2. Obligatory clinical seminar; 3. Clinical work under supervision. Candidate training in child and adolescent psychoanalysis can take qualifying colloquium in this specialty after obtaining his/her psychoanalyst’s license. After passing the relevant colloquium, he/she is awarded the status of a child and adolescent psychoanalyst. Costs of the training • Each cycle of seminars costs 200 zlotys and is paid for separately. Payments are made before commencing each individual seminar cycle. During the training, candidates must attend ten cycles of obligatory seminars (eight Freudian seminars and two professional ethics seminars) and at least 16 cycles of facultative seminars. The number of clinical seminars depends on the course of the candidate’s theoretical training and his/her clinical work, and includes a minimum of 16 cycles. • Costs of personal psychoanalysis and supervision are determined individually by analyst/supervisor. • On being admitted to the training, candidates must pay membership fees to the Polish Psychoanalytical Society in the amount of 100 zlotys per month. 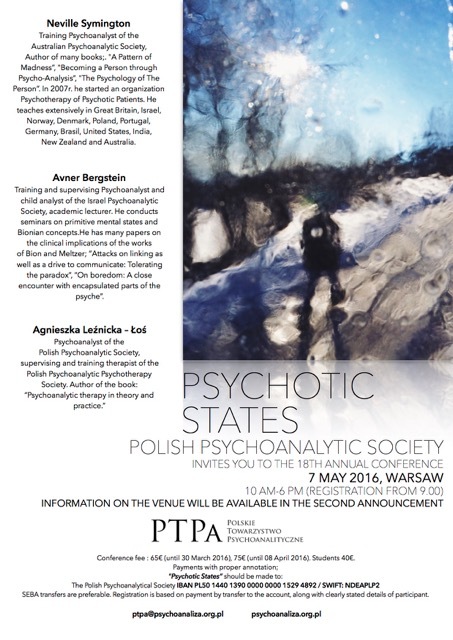 The Polish Psychoanalytical Society ensures that the work of its members retains the highest professional and ethical standards. If the Patient or someone close to him or her has any doubts or questions concerning ethical issues or wishes to file a complaint, he or she may contact the Chairperson of the Ethical Committee, Mr. Wojciech Sobański, e-mail wojteksobanski@go2.pl This code binds all Honorary Members, Members, Candidates and administrative staff of the Polish Psychoanalytical Society. 1. A psychoanalyst or candidate must act at all times in a way that he believes to be in the best interest of the patient. 2. No psychoanalyst shall knowingly participate in the violation of any individual’s basic human rights as defined by the UN Declaration of Human Rights. 3. A psychoanalyst or candidate must exercise all appropriate restraint, physical, verbal and social, towards the patient. A psychoanalyst shall have no sexual relations with a patient or candidate under the psychoanalyst’s treatment or supervision. 4. A psychoanalyst, candidate or staff member must treat the patient’s communications with confidentiality. Except when there is a danger for patient’s life or health or with the patient’s express consent, the patient’s anonymity must be preserved at all times. 5. A psychoanalyst or candidate must conduct himself in such a manner as not to bring psychoanalysis, Society, colleagues or himself into disrepute. 6. As a psychoanalyst, he must at all times be considerate to members of the public, other professionals, members of other organisations and institutions. 7. A psychoanalyst shall maintain an honest and open relationship with each patient, subject to reasonable professional constraints, and shall not mislead patients or their families or engage in any act of fraud, deceit or coercion. 8. A psychoanalyst adjudged by the Executive Council to be guilty of a breach of this Code may have his membership withdrawn, be suspended from membership or be admonished. WHY DOES PATIENT RECLINE ON A COUCH? It was the founder of psychoanalysis, Sigmund Freud himself, who initiated the use of the couch in the treatment of his patients. Today every psychoanalyst’s consulting room is furnished with a couch. The reclining patient cannot see the analyst, who sits behind him. Also the analyst cannot see the patient’s face during the session. By not allowing eye contact between the two, the patient finds it easier to articulate his thoughts, even those most difficult and secret, while the analyst is free to listen to the patient talking and interpret what he says. The reclined position also helps the patient relax, and by eliminating external stimuli and the temptation to watch the analyst’s face, he is more able to focus on his thoughts and feelings. However, in certain cases the analyst may choose not to place the patient on the couch, for example if this position may strengthen patient’s anxiety. Psychoanalysis is not determined by the use of a couch, but rather by the way of thinking about the development and dynamics of the patient’s inner life, understanding and interpreting unconscious ideas, including transference of the patient’s feelings towards significant people in his life onto the analyst, as well as frequency of sessions. WHY ARE PSYCHOANALYSIS SESSIONS HELD SO FREQUENTLY? Psychoanalyst usually sees his patients four or five times a week. He is available to the patient at fixed appointments. Sessions are usually 50 minutes long, although certain analysts prefer 45 minutes. The high frequency and regularity of the meetings create a framework for the development of the psychoanalytical process. Even when the patient consciously wishes to implement changes in order to improve his quality of life, there is an unconscious part of his psyche that resists those changes. This resistance is governed by pathological defense mechanisms developed over the years. Daily meetings make it easier to break down these defense mechanisms and allow the patient to gain access to his inner world, without which it is impossible to make the psychological shift. IS IT TRUE THAT THE PSYCHOANALYST KEEPS SILENT DURING THE SESSION? The interaction between the psychoanalyst and the patient differs from an ordinary conversation. The psychoanalyst doesn’t suggest the subject for discussion, and leaves the initiative to the patient. If the patient is silent, the analyst also remains silent and waits for the patient to find within himself what is troubling him. The analyst listens attentively to the patient, paying close attention not only to the openly expressed content, but also to its unconscious meanings. On this basis, as well as what he already knows about the patient, his history, and the defense mechanisms he uses, the analyst formulates interpretations which he presents to the patient. It can be said that the psychoanalyst speaks when he has something important to say. Of course different analysts have different temperaments and styles of working, so the amount they say during sessions will also vary. DOES PATIENT FORM A DEPENDENCE ON HIS PSYCHOANALYST? Forming a dependency is widely regarded as one of the main risks with psychoanalysis. People can become addicted on substances and activities such as alcohol, drugs, gambling and computer games, which can become very destructive. Forming addiction to other people can be equally destructive, and it may occur that an individual with such tendencies can become a psychoanalytical patient. The analyst will work with the patient on solving this problem. However, during psychoanalytical process, many patients develop feelings towards their analysts which can be called more adequately as dependence. In a way, dependence is a component of every relationship, and the analyst-patient relationship is no exception. It means that the individuals participating in the interaction have developed a bond, which implies they wish to be liked, wanted, appreciated and understood. The feeling of dependency, as well as other feelings that develop over the course of the psychoanalysis, is examined and interpreted. As the treatment progresses, the patient’s dependency on the analyst should gradually decrease, and the patient should become capable of making independent decisions about himself without losing his ability to form bonds and relationships with others and acknowledging their importance to him. WHAT TYPES OF DISORDERS AND ILLNESSES CAN BE TREATED WITH PSYCHOANALYSIS? Psychoanalysts mainly treat individuals suffering from neuroses and personality disorders. They may manifest with symptoms such as anxiety, phobias, intrusive thoughts and behaviors, impulsive behavior, and mood disorders. Sometimes psychoanalysis patients are individuals suffering from psychoses. According to psychoanalysis, psychoses may have at their root serious developmental problems in early life. Psychoanalysts treating individuals suffering from psychoses generally work closely together with the patient’s psychiatrist, who may also prescribe a course of pharmacotherapy. IS PSYCHOANALYSIS VERY EXPENSIVE? Yes and no. The cost of an individual session is generally fairly low (lower than the cost of an appointment with a doctor or psychotherapist using other treatment methods); however, because of the need to hold frequent sessions (usually four times a week), the monthly cost is high. In Poland, psychoanalysis treatment is not reimbursed by the public health insurance. WHAT IS THE COST OF PSYCHOANALYSIS? Psychoanalysts work privately, and they set their own costs per session. Session cost depends on the psychoanalyst’s experience and the city in which they work; it generally ranges between 90 and 120 zlotys (average price in 2014 is 100 zlotys). All monthly sessions need to be paid for, with exception of: holidays, breaks preannounced by the analyst and of course sessions cancelled by the analyst for reasons beyond his control. Because the entire course of treatment is so long, the cost of the sessions may increase from time to time (generally once per year), with the analyst announcing the rise to the patient with proper advance. Psychoanalysis is a theory of how the human mind works, a method of studying and also of treating it. The key tenet of psychoanalysis is the concept of the unconscious. A large share of the mind is never conscious and will never become so. Additionally, it is possible for conscious experiences to be forgotten – repressed into the unconscious – but they may remain active in the background and continue to affect our lives. As a theory of the human mind, psychoanalysis had a great impact on intellectual trends of the 20th century, and continues to be an inspiration for various disciplines in the contemporary humanities. Specialists in many fields (philosophers, arts, literature and films critics) and psychoanalysts themselves use psychoanalytical theory to interpret cultural, social and political phenomena. As a method of studying and treating patients, psychoanalysis assumes that alongside inherited factors, our personalities are shaped by our relationships with our parents, as well as key life experiences – birth, sexuality, love and hate, loss and death – which we all experience throughout our lives, and which are frequently a source of internal conflict. These experiences, and our fantasies surrounding them, create certain patterns which remain unconscious and define our relationships with ourselves and others in our later lives. Patients who undergo psychoanalysis are able to discover some of their unconscious mechanisms and conflicts, and thereby to take greater control over their own lives. What are the roots of psychoanalysis? Psychoanalysis is a theory and a method created at the turn of the 20th century by the Viennese doctor Sigmund Freud (1856-1939), who going against his medical opponents in Vienna, gathered together circle of psychiatrists and other specialists, fascinated with his maverick thoughts about the functioning of the human mind. Freud’s colleagues and disciples propagated his theories across Europe and both Americas. Through the work of subsequent generations of his successors, psychoanalysis continues to develop dynamically, creating new psychoanalytical theories inspired by different aspects of Freud’s theories. His achievements have proven to be so groundbreaking and inspiring that they have laid the foundation for modern psychology and become a standard for many psychotherapeutic methods currently in use. In 1910, Freud and his associates founded the International Psychoanalytical Association (IPA); it has continued to operate ever since, currently numbering over 12,000 members and over a hundred associated psychoanalytical organizations from countries from all continents across the globe. 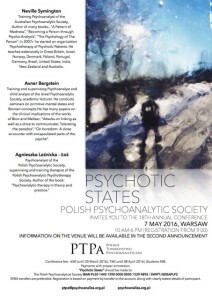 The Polish Psychoanalytical Society became a member of the IPA in 1997. PSYCHOANALYSIS AS A TREATMENT Why psychoanalysis? Psychoanalysis – a deep and intensive process of examining the mind that enables us to learn about our unconscious – can be undergone by people who wish to find out more about their inner psychology and the mechanisms that guide them, yet aren’t easy to understand. Psychoanalysis may serve as a way of developing one’s personality and attaining inner freedom, which in turn makes it easier to form long-lasting, meaningful relationships with others and use one’s own abilities more creatively. This is why psychoanalysis as a treatment method is recommended for people experiencing serious problems in their lives. For example, they may have trouble forming close relationships with others, experience difficulties in existing relationships, struggle to come to terms with their sexuality, suffer from conflict in social situations, experience professional setbacks, and so on. Individuals who have had traumatic experiences in the past may struggle with flashback and memories of those events, and they may have problems with trusting others, making it difficult or impossible to function in society. When certain people lose someone close, they may be unable to stop grieving for them and move on with their own lives. Others may feel that their creativity is being stifled for whatever reason, making it difficult for them to work or study. Sometimes psychological problems reveal themselves by a variety of symptoms. Certain people find their lives are made difficult by rigid forms of behavior and the need to perform certain rituals. Some experience panic in wide open spaces, while others are anxious in enclosed or crowded situations. Anxiety is a frequent symptom reported by patients registering for psychoanalysis; it can concern something that is better or less defined, although it is not uncommon for people to experience existential anxiety about the future and whether they will be able to cope with its challenges. Patients also often report depressive episodes – low mood, reduced activity, feeling of hopelessness, sadness. Many people also report various somatic complaints for which no medical cause has been found. People who decide to undergo psychoanalysis generally suspect that the reasons for their difficulties and struggles lie within themselves. They wish to learn more about those reasons to resolve psychic conflicts that make their lives difficult. Psychoanalysis, like any other type of treatment, aims to bring patients relief from their suffering. However, psychoanalysts do not focus on eliminating the symptoms of the suffering, but rather they search for its origins in the patient’s unconscious. They reach out for patients’ earliest experiences and analyze their effect on their present relationships and behavior. Some patients undertaking psychoanalysis have already sought other therapies and found that these therapies have been unsuccessful or their effects have been short-lived. In some cases, the analyst and the patient decide that it will be more appropriate to start a course of psychoanalytical psychotherapy rather than actual psychoanalysis. Psychoanalytical psychotherapy is founded on the same theoretical principles, although it is generally less intensive (2-3 instead of 4-5 weekly sessions). In some cases, the patient may move on to psychoanalysis following a course of psychotherapy. Before embarking on psychoanalysis Before deciding to start psychoanalysis, the psychoanalyst and potential patient hold a few consultation sessions. The way in which the patient responds to the psychoanalyst’s preliminary hypotheses and interpretations, if they evoke his interest, whether he engage in discussion, whether the analyst’s trait of thought stimulate him to seek a new approach to his problems, all this affects the decision whether psychoanalysis is the right therapy for this individual patient. The psychoanalyst informs the patient about the course of psychoanalytical treatment. During the consultations, the patient is given an opportunity to decide whether he wish to undergo this process, and whether they feel up to it. What is the course of psychoanalytical treatment? Since Freud’s day, psychoanalysis has been referred to as “talking cure”. Psychoanalyst does not prescribe any medication nor does he perform any medical procedures. In his contact with a patient, psychoanalyst acts reserved, does not bring up his private matters and avoids any physical contact with a patient. Psychoanalyst’s neutral attitude aims to foster the patient’s uncovering of his unconscious fantasies regarding who he believes the analyst is, what the analyst thinks and what the patient can expect from him. This allows analyst to discover how the patient makes him a representative of important figures from his past. This is known as transference. The understanding of this phenomenon, rooted in the theory that we all unconsciously repeat various patterns and relationships which we learned in childhood, is a key tenet of psychoanalysis. Thus the analyst knows that the intensive emotions experienced by his patient in the consulting room are rooted in past experiences with other people and in other situations from patient’s past. The analysis of transference allows the patient to understand his feelings, start building new, more rewarding relationships with people important to him, and helps him make deeper changes in his personality. Sessions last 45-50 minutes and are held four or five times a week. The patient reclines on a couch, with the psychoanalyst sitting out of his view. The analyst encourages the patient to make free associations – voicing everything that comes to his mind, including his dreams and fantasies. This allows the patient to reach the unconscious areas of his psyche, which are inaccessible by any other means. The psychoanalyst provides an interpretation of his understanding of the thoughts and feelings expressed verbally and non-verbally by the patient. This concerns both the patient’s experiences in various external relationships and situations, and those formed as a result of his interactions with the psychoanalyst. How long does treatment take? For psychoanalysis to have lasting effects, it should continue for a long time – several years. It is impossible to determine the length of the treatment at the onset of the psychoanalysis. Why is the process so slow? Our personalities take years to shape, and often the mechanisms developed during our lifetime are ineffective or even pathological. It is difficult to imagine that something that took such a long time to form could be changed in a short space of time. The process requires the patient and analyst working together for many hours to jointly consider the roots of the patient’s problems and seek understanding so that the patient understands that changing may bring relief from his suffering. The course of psychoanalysis comes to an end when both the analyst and the patient are convinced that finishing it is desirable and advisable. Sometimes the patient experience extremely difficult and painful feelings that drive him to wish to stop the psychoanalysis. Of course he is free to do so at any point, yet any such sudden decision will prompt the analyst to try to understand the reasons behind the patient’s decision and to interpret them. In many cases, this convinces the patient to change his mind and continue the treatment. Psychoanalysis of children and adolescents Children and adolescents can also experience symptoms that seriously affect their development. They may include conflict with family or friends, trouble at school, impulsive behavior and difficulties in controlling it, eating disorders (such as anorexia or bulimia), uncertainty about their sexual identity, and depressive episodes. Younger children may experience problems including anxiety or aggression, eating or sleeping disorders, difficulties controlling their excretory functions, or an inability to engage in play. It is understandable that these worrying symptoms would drive parents to seek help from a psychoanalyst specializing in treating children and adolescents. While therapy sessions for teenagers may take the same format as in adults, psychoanalysis of younger children requires a different approach. The child isn’t confined to a couch, but he is free to play or draw. The analyst accompanies the child in these activities. The content of play and drawings has the same function as free associations of adult patients and is interpreted. Before taking on a child patient, the psychoanalyst holds consultations with the child and his parents. During the course of the treatment, he regularly meets with the parents, although without going into details of what the child is saying or communicating during the analytical sessions. Psychoanalysts are always bound by the code of confidentiality regarding their interactions with the patient. If the patient is an older teenager, the psychoanalyst may opt out of any meetings with his parents to reassure the patient that he has a right to his own privacy and to be responsible for his own life. Who can conduct psychoanalysis? Psychoanalysis can be conducted by licensed psychoanalysts and candidates members of the PPS, who train in psychoanalysis. 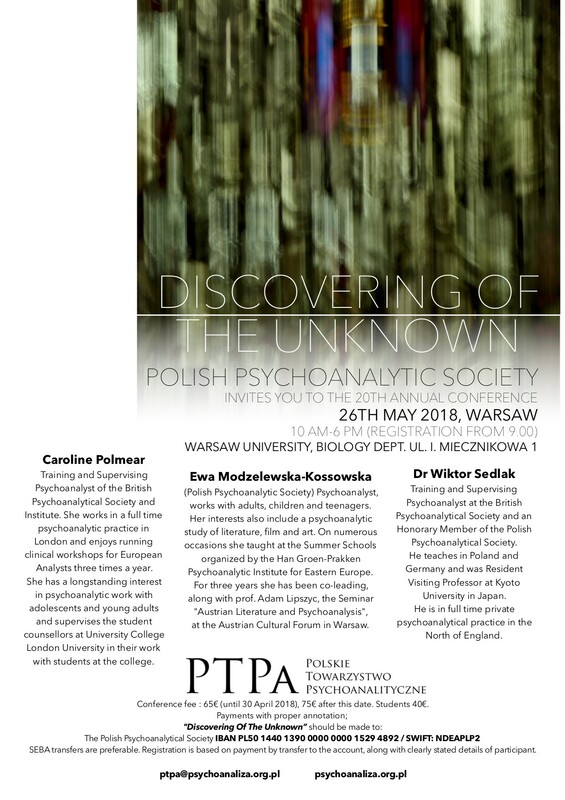 The only licensed psychoanalysts in Poland are members of the Polish Psychoanalytical Society who have undergone several years of training at the PPS or another society affiliated with the International Psychoanalytical Association (IPA). Besides theoretical and clinical curriculum, candidates undergo psychoanalysis themselves. This psychoanalysis follows the same format as the psychoanalysis of their patients. Undergoing their own training psychoanalysis enables analysts to resolve their own problems, which in turns means they will not be a barrier in their treatment of others. Candidates of the PPS can conduct psychoanalysis of patients as part of their clinical training. Their cases are supervised by teachers – members of the PPS or another association affiliated with the IPA. Children and adolescents psychoanalysts are licensed psychoanalysts who have undergone additional training in this field. Psychoanalysts are bound by the Ethical Code of the Polish Psychoanalytical Society.